On 3 April 2015 the International Protection Centre held its last ‘Strasbourg Get-Together’ before an enforced, temporary break. 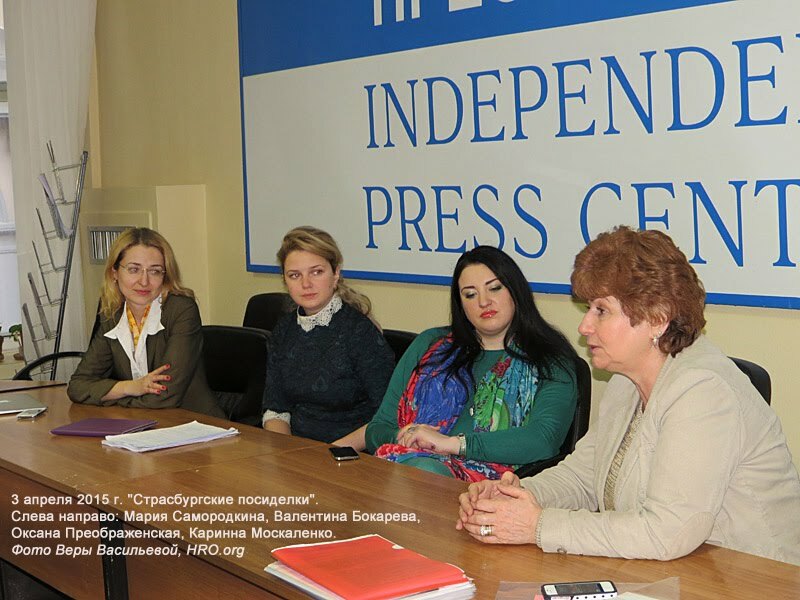 As Karinna Moskalenko said, the break was caused by the closure of the Independent Press Centre in Moscow which until now has been the permanent home of the sessions. The Independent Press Centre has closed because it was threatened with designation as a ‘foreign agent’. Those taking part in the event, apart from Karinna Moskalenko, project director of the International Protection Centre, were Centre staff Maria Samorodkina, Valentina Bokareva and Centre director Oksana Preobrazhenskaya. “This is probably our last meeting in this wonderful place, the Independent Press Centre, which has made us welcome for many years, and where we have held our ‘Get-Togethers’. Strictly speaking, from 1 April the Independent Press Centre will no longer have these premises. The human rights community is, with good reason, frightened by the Russian authorities because of the danger of being designated a ‘foreign agent’. I want to assure the members of our Centre, those we defend in the courts, and our friends: we always work very transparently, and this is an important protection for us in our legal work. I want to call on all the lawyers who are here, especially those who work in the courts, to be proud of our profession, because we have always, even in the hardest of times, sought to achieve our independence and consider any kind of attack or pressure on members of our profession to be impermissible. Lawyers are always subject to various kinds of attack and infringements, but until now we have successfully withstood these attacks. Professional lawyers have done their best to work in the Stalin times and in other periods of the Soviet regime. We even defended political prisoners, though it has to be said without success. Today I had the privilege and at the same time the misfortune to defend Sergei Evgenievich Mokhnatkin. With zero impact, at least in the Russian Federation. We have everything ready for an application to the European Court of Human Rights. We shall continue in the future to do what we consider to be our duty, professionally, in good faith. We continue to work – both those who have worked at the International Protection Centre for many years, and those who are still moving from stage to stage in their legal qualifications, and those who have recently joined us. Of course, not the same volume of work as hitherto. Of course, the law on ‘foreign agents’ deprived us of the possibility of foreign funding. The authorities are banking on the fact that the human rights movement will cut back on its work. Perhaps the only optimism that our work gives us today is that, having exhausted all legal remedies for legal defence within the country, we nonetheless have an important means of leverage: making an application to the European Court of Human Rights. In the event that there has been a violation of human rights in any of the 47 member-states of the Council of Europe (including Russia) and if all effective legal remedies have been exhausted and the violated rights have not been restored, legal practice has yet to invent anything more effective than an application to the European Court of Human Rights. The European Court of Human Rights is a body that assesses only issues concerning violations of human rights, nothing else. That is why you must never believe the Russian authorities when they say that the European Court is interfering in the internal affairs of the state. The European Court is careful to ensure that it does not get involved in discussion of political issues. The European Court exclusively considers matters of law. Only legal matters are the subject of our work. We do not exclude any scenarios. I am talking about two possible negative courses of events. First: the human rights movement, including the legal community, might be confronted by yet more stringent restrictions on its work. The second scenario is much loved by, and very dear to, those who, I would say, are among the less responsible representatives of the authorities. This is an attempt to move away from Europe altogether. It may be that these two negative scenarios could even take place simultaneously, hand in hand. Of course, it is not only the authorities in Russia, but in any country, that want to escape from accountability to their electorate, the people, and international human rights bodies. But for as long as our lawyers, our advocates, work at the Centre, we shall continue to use international human rights standards in our legal practice. Russia today is already integrated in the world, in Europe, to such an extent that international standards will remain relevant even if the Russian authorities, pursuing short-term aims and a false understanding of Russia’s interests, want to reject membership in the Council of Europe. We are convinced of this not least because since 1 January 1992 (earlier than Russia came under the jurisdiction of the European Court on 5 May 1998) our country came under the jurisdiction of a quasi-legal body for the protection of human rights: the UN Human Rights Committee. The International Protection Centre continues to help Russian citizens who have no resources to pay for professional legal assistance. I also hope that we shall find other premises where we shall be able to continue our series of ‘Strasbourg Get-Togethers’.